How does one explain the world of the White Continent without overusing the same adjectives?? 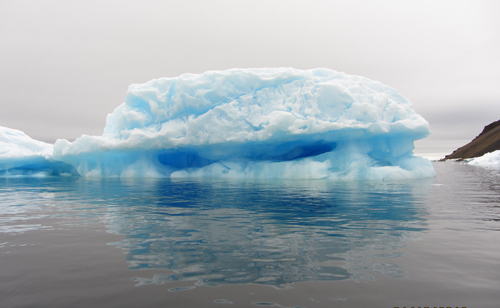 This morning's wake up call found the ship surrounded with blue and white ice bergs and ice flows. 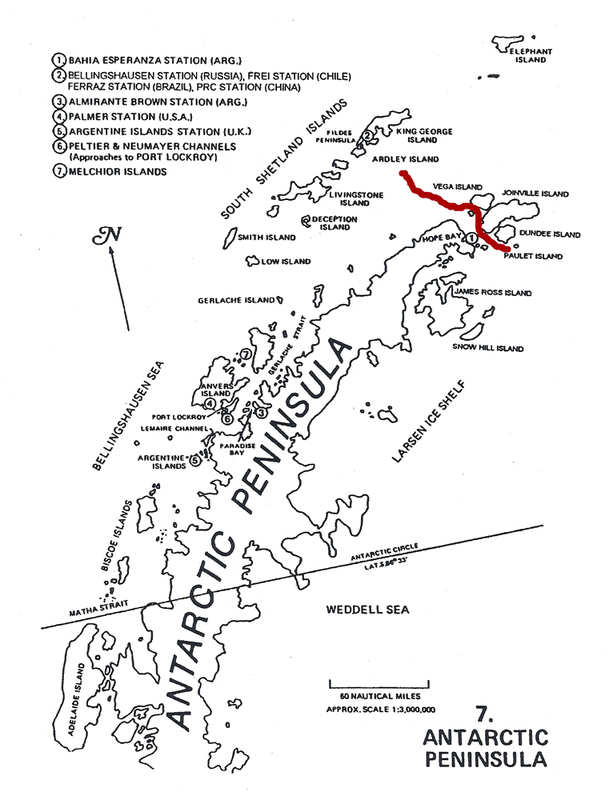 We are just off of Devil's Island having crossed the Bransfield Strait during the night. 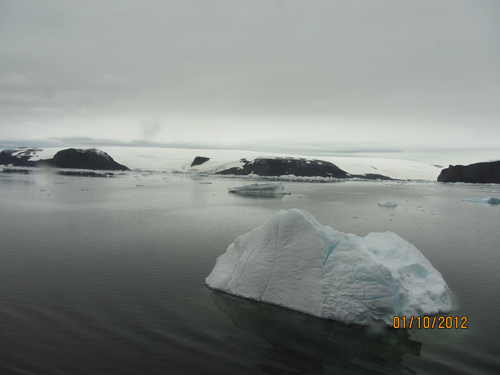 The majestic sight of the ice contrasted against the dark waters is beyond description. The pictures taken don't do it justice. Standing at the porthole looking out over the vista brings on a total feeling of smallness and tranquility. This is Nature in her purest! Each direction brings another sight "untouched by human hands" and in harmony with its surroundings. 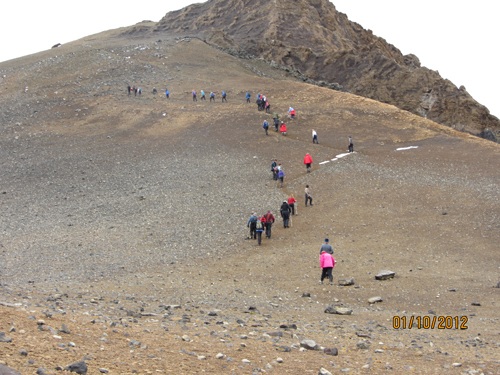 This is summer here so the ice field is the result of the melting. 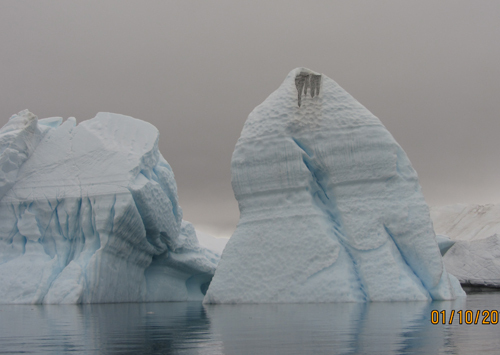 As the glaciers melt, they "birth" icebergs into the water. As those themselves melt they send off chucks of ice creating a "mine field" of white. 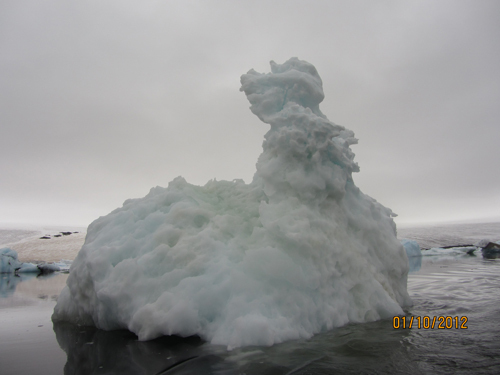 It is not uncommon to hear loud "gun shots" as these ice phenomenon break apart. Today it is a trip to Devil's Island, a small island north of Vega Island. The island has two rounded peaks that look like "devil's horns", thus its name. 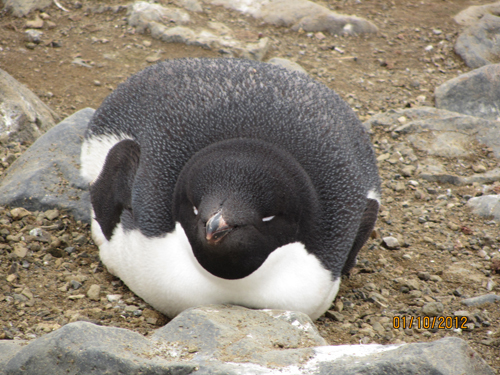 It is the home of a large colony of Adelies penguins. 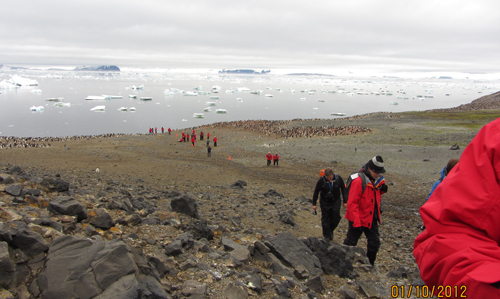 A hike up the steep side of one of peaks allows for a grand vista of the bay, the colony, and the surrounding ice field. 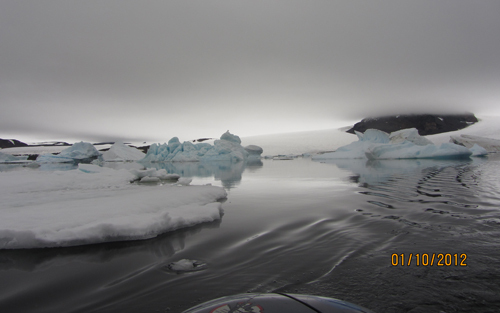 The call goes out to "layer up" and it is into the zodiac for a short ride to shore. 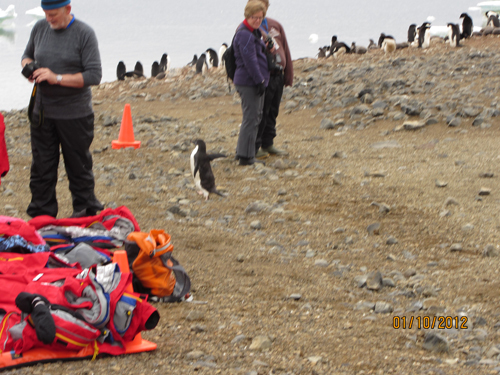 Waiting patiently for the zodiacs to land are two adelie penguins resembling tourist welcoming guides to a museum. 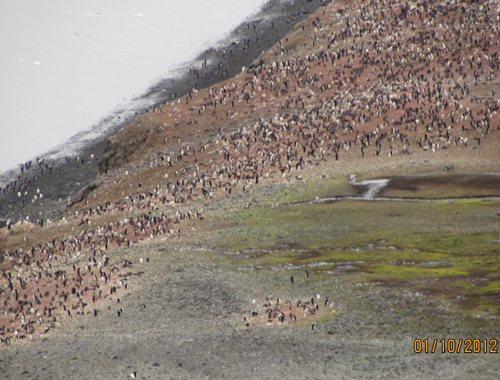 Up and out of the craft and over a stony beach to the colony sitting high on the hill side. This is the time of year that the chicks have already been hatched and are now big enough to just hang around within the colony. They don't wander off out of fear of the skua who finds the birds "tasty". 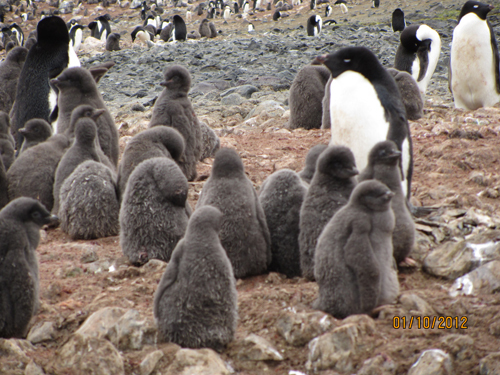 The entire colony has over several thousand birds within its boundary. A very distinct system of organization is in place. 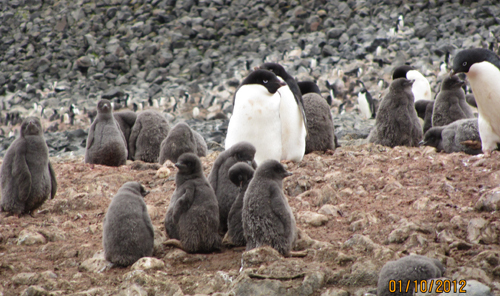 Like the gentoo and the chipstrap there is a hierarchy in place and each member knows his/her role. 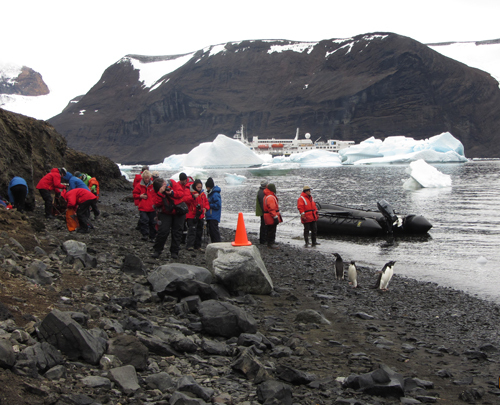 After enjoying the company of the Adelies it was off to cruise through the ice field in the zodiac. 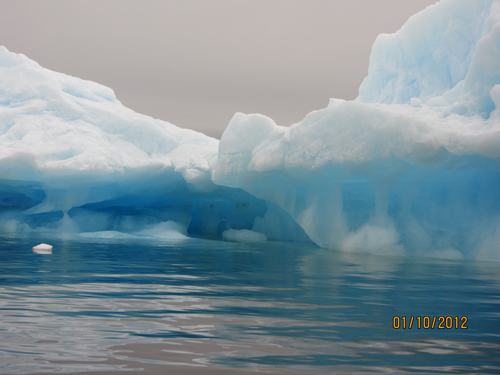 The ice is blue in these waters due to its density. It looks like someone had carefully and methodically poured blue ink over them. Each is different and magnificent. 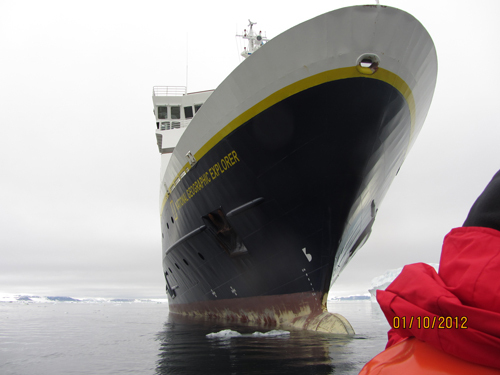 Returning to the ship for lunch brought on two surprises. 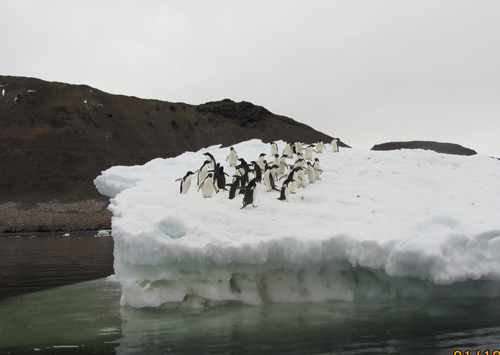 An Empire penguin was standing at attention with two smaller adelies on an ice float in front of the ship. Shortly thereafter, a school of killer whales came to play off the bow. The research team studying these animals quickly assembled and zodiaced out to get closer and try to extract some tissue for later study. The whales won't even know they were pricked! 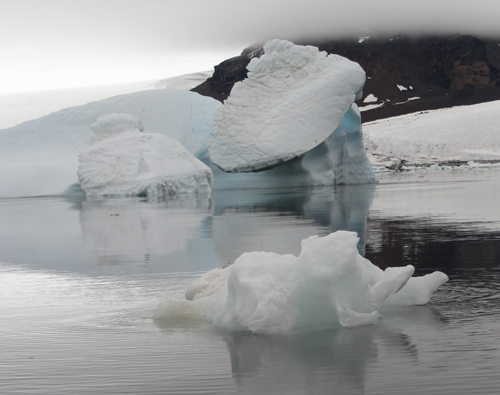 Upon the return of the research team to the ship we will set sail through Prince Gustave Channel on our way to Paulet Island. 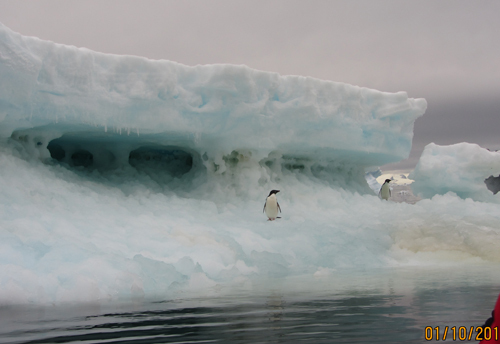 We hope to be in the Weddell Sea for a few days. 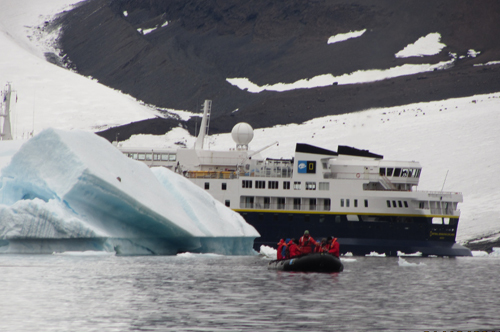 The weather conditions are in our favor and this area is very rarely visited by tour ships. 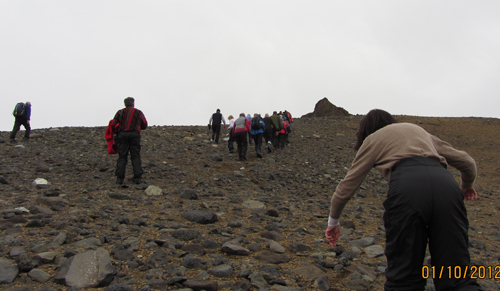 Okay -- To The Top! 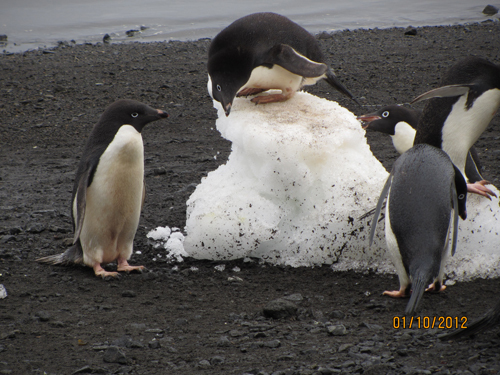 Adelie Penguin Guide: "Too warm for jackets -- put them here!" 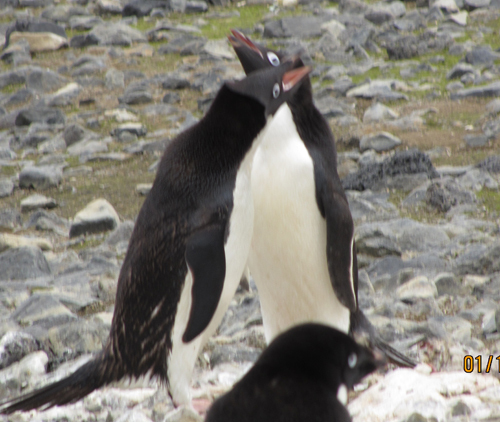 Grandpa Adelie: "No Way Am I babysitting! It is MY naptime!!" I Dare You to Jump in First!